The Dura Feeder is the perfect solution to prevent feed waste. They come in three sizes to match your flock. The medium trough (4"W x 39"L x 3"H ) will accommodate 30 adult birds. The small trough (4"W x 19"L x 3"H) is ideal for flocks of less than 20. Hinged grill prevents birds from walking in feed. 4BT3 is a large trough feeder. Solid pvc construction means years of use. 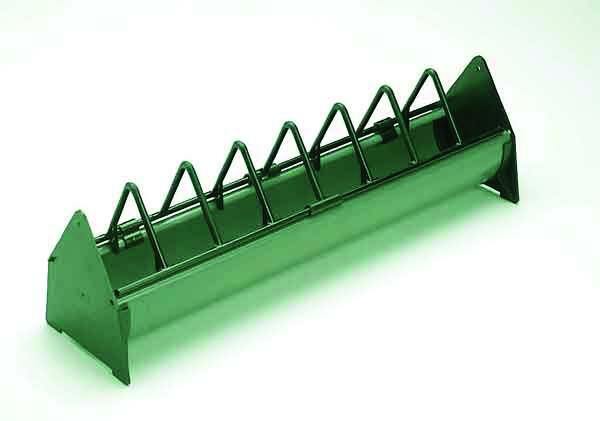 Supplement your free range flock with this 60" long and 7" wide trough feeder. Built in Anti-roost reel keeps the birds out of the feed. Curved design keeps feed from being scratched out. The Best Trough FeederThe Dura Trough feeder is the best one I have used. Very little feed is wasted and the 4 week old chicks using it now do not hop on the feeder. I am ordering a second one for my flock of growing chicks.